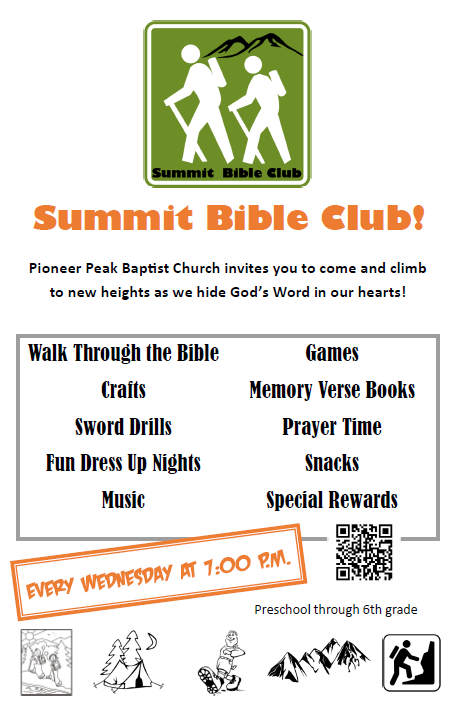 Each Wednesday night a special program for kids, Summit Bible Club, meets at 7:00. We enjoy singing, prayer time, a special Bible lesson, snacks, a craft, and games. It’s an extra fun time for all! Kids will have a set of verses to memorize each week, and as we keep track of and reward their accomplishments our young people will be climbing to new heights in their Christian walk, hiding God’s Word in their hearts. Don’t miss out!